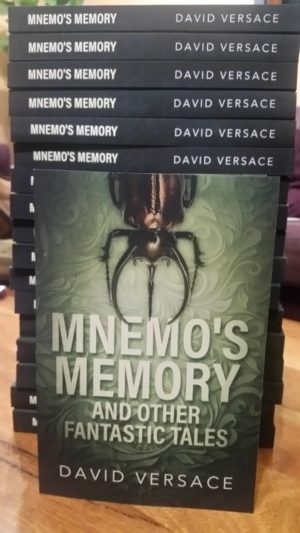 My box of print copies of Mnemo’s Memory and Other Fantastic Tales arrived this week. It was an exciting moment, but in itself not so particularly noteworthy as to warrant a blog post. Then I remembered: this is my sort-of-anniversary. Five years ago this month, I stood up with a veritable army of co-authors at the Conflux 9 launch of the CSFG anthology Next. My contribution to the table of contents, ‘Imported Goods – Aisle Nine’, was my first published short story. I’ve written two extremely unpublishable novels (one of which might eventually be salvageable). I’ve written forty consecutive flash fiction stories without missing a Friday. And I’ve published a collection of short stories. In the scheme of things, it’s not the most prolific output, but it’s not nothing either. Nothing is what I had to show for the previous twenty-five or so years . I’m pretty happy to have crossed that little threshold from “occasionally published short story writer” to “self-published author”. There are more milestones to hit, of course. For one, I would love for all of my stories currently choking up publishing pipelines to actually come out. There’s hints of movement here and there, but in most cases there’s nothing I can do to push things along so I’ll just keep on keeping on until the news changes. I’m also ready to make the move up to being a self-published novelist. I’m currently working out the logistics of meeting a particular self-imposed deadline while also travelling overseas for five weeks in June. I think I can do it, but in case I can’t, I’m not going to jinx myself here. More news when I’m confident I won’t drop the ball completely. I think it’s good to mark notable occasions and celebrate the little victories. I’m going to go write this week’s flash fiction story and sip a wee dram of whisky. Salut! Not entirely true. I wrote some awesome tabletop roleplaying campaign materials, and a bunch of great songs, if I say so myself. But they don’t really count towards this score. This entry was posted in Announcements, Writing news and tagged anniversary, csfg, mnemo's memory, next, print. Bookmark the permalink. Woohoo!!! You can do it!!! Get that novel out. You make it sound like I need to induce vomiting! …which actually might not be that far from the truth, come to think of it. Congratulations, mate. Can I order one online now? I’m pretty technically incompetent as far as cyber copies go. Mother I am going to mail one to you! You don’t need to buy a copy of my book!